Plate 13 from the fourth set of Thomas and William Daniell's 'Oriental Scenery,' which they called 'Twenty-four Landscapes.' The views progress northwards from the far south at Cape Comorin to Srinagar in Garhwal in the Himalaya mountains. Najibabad was a prosperous town under the rule of the Rohilla Afghans. The Daniells stopped there while waiting for permission to enter the kingdom of Garhwal in the Himalaya mountains. 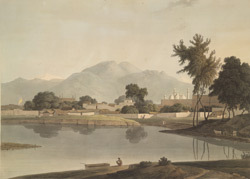 The Jami Mosque with its triple domes and the entrance gate to the Rohilla palace on the left can be seen in the background in the aquatint.